I have solved the answer to Mondays. Not like Mondays can really BE a question. According to the calendar on my phone, we kinda HAVE to have them. Aaaaand like 4-5 times A MONTH for a WHOLE YEAR. Who decided that and why was I not involved in that decision? Anyway. Mondays = USUALLLLLY not the best thing ever due to just wanting to stay on my current Gilmore Girls weekend Netflix binge (don’t spoil the new episodes for me, I AM NOT THERE YET!) but, alas, BACK TO THE GRIIIIIND. So many extended letters today. Roll widdit. I used to tell you that the cure to all Monday sadness that happens in your real-person life EVERY SINGLE week, was to wake up to cookie dough overnight oats, strawberry cheesecake overnight oats or healthy blueberry muffin breakfast cookies. I mean, rolling your groggy self out of the cozy-comfort of pillows and blankets and warm fuzzy feelings is SOMUCH easier knowing that something dessert-flavored is awaiting your grumbling, it’s-morning-I’m-HUNGRY belly. But that was before these vegan, 5 INGREDIENT (!!!) 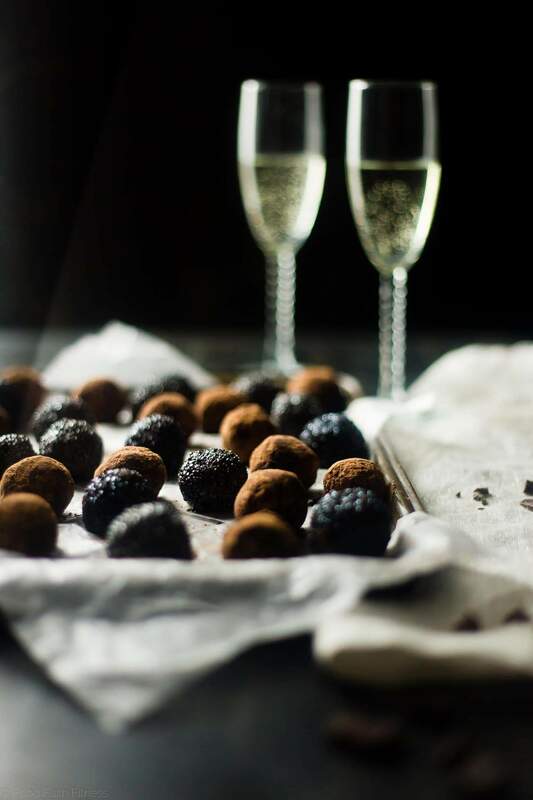 champagne avocado chocolate truffles rolled (laugh with me) into my life, and knocked me down with fizzy-booze-infused-rich-and-fudgy-OMG-chocolatey deliciousness. BTW, I love that we’ve established and internet friendship SO DEEP and TRU that you know what the above sentence means. <3 HEART YOU. 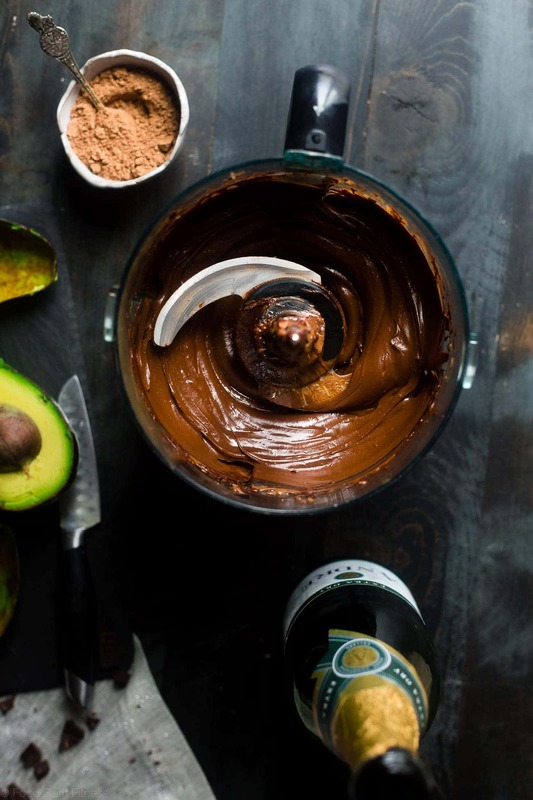 It’s no secret that my making-truffles-with-avocado love is SERIOUS business. We had it in the chocolate mint avocado cookies, skillet peppermint vegan brownies and last year’s healthy chocolate truffle recipe with coconut. Just like cauliflower is the miracle worker of the vegetable world, avocado is the miracle worker of the healthy-heart-good-4-U fat world. It makes all things creamy, delicious PLUSPLUSPLUS NUTRITIOUS. And we should eat nutritious food for breakfast RIGHT? AAAAAND the little champagne hit in these rich, creamy bites of chocolate bliss is only going to ensure that your Monday will be EXTRA FUN. You remember the cacao peanut oatmeal breakfast bars with banana from the summer yes? Well, we’re bringing the cacao party back! 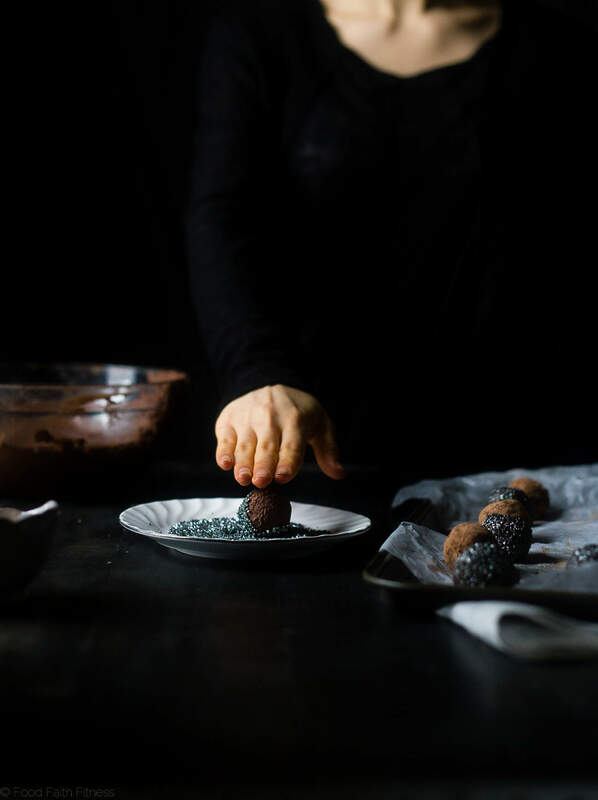 Part of the super-dense-rich vibes that are going to happen inside your face when you bite into each velvety smooth bite of these avocado vegan chocolate truffles, is from Better Body Foods Cacao powder instead of COCOA powder. Do not get the 2 confused friends. 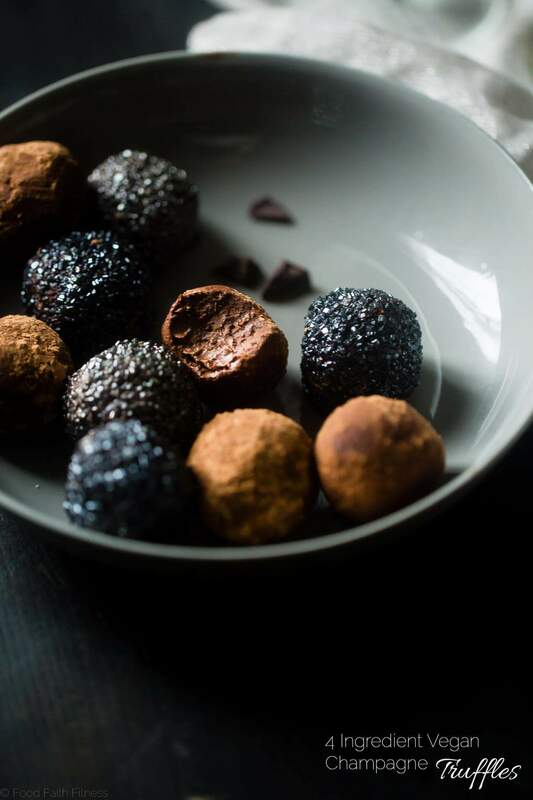 Cacao is SO much richer, darker and makes these truffles a chocolate-loving-persons (everyone’s?) DREAM. Plus, it’s all superfood-y, health-ful and all that stuff that makes you happy when it is used to describe food that is actually SO YUMMY right now. If you’re not one of those people who can “do chocolate” for breakfast (who are you?) then I am going to suggest that you make these champagne truffles for that super-fancy-person NYE party that I know you’re throwing. 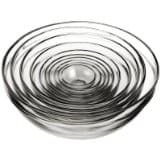 You could even serve them with the healthy champagne cocktails from LAST WEEK. And, yes, I DID plan the sequence of posting so that you would be ARMED and READY to rock NYE with allll the champagne goodness. 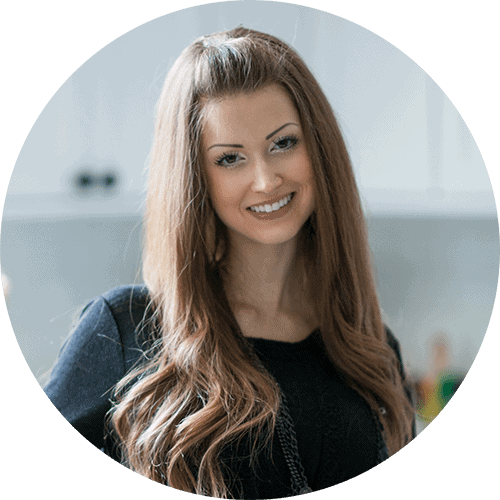 Word of advice/a look into the real life of a food blogger: sometime we get ideas that we think will be SO TRENDY and FUN in photos. Which is why I rolled some of these in glittery, sparkly silver sprinkles. BUT, I am going to warn you: DON’T DO IT. 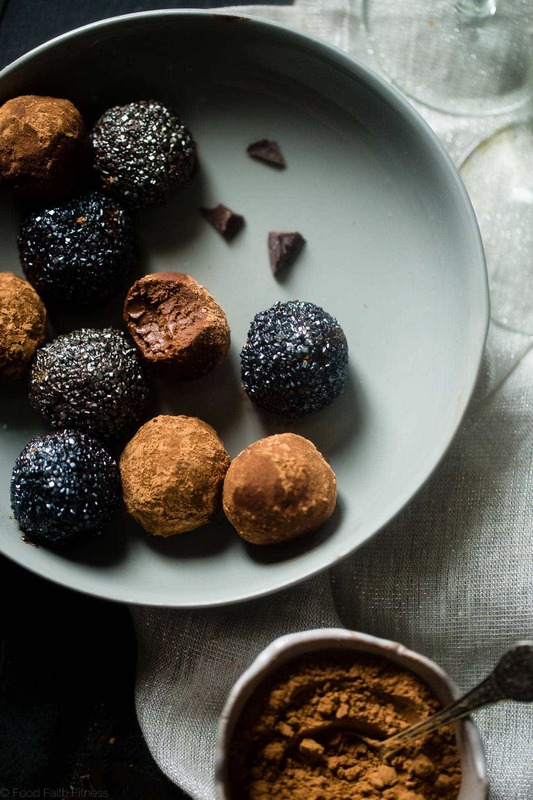 Just stick to rolling these healthy chocolate truffles in extra cacao. I put them down on the pan and the sprinkles started to MELT which was totally messy all over my hands and not-fun-times at all. Had to warn you though. Last warning: I take Z-E-R-O responsibility for whatever happens after you consume a batch of these avocado vegan chocolate truffles. 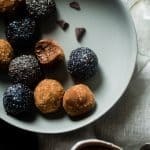 These Avocado Vegan Chocolate Truffles use a secret, heart-healthy ingredient to make them so creamy! Add a little champagne to make them perfect for New years Eve! 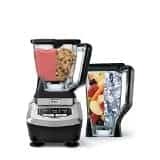 Add the mashed avocado and cacao powder into a large food processor and blend until smooth and combined, stopping to scrape down the sides as necessary. 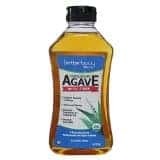 Add in the champagne, agave (if using) and a pinch of salt and blend until smooth and combined. Place the chocolate in a microwave-safe container and heat using half power, and 30 second cooking intervals, stirring between each interval, until smooth and melted. Add the melted chocolate into the food processor and blend until smooth and combined, scraping down the sides as necessary. Scrape the mixture into a medium bowl, spreading out evenly. Cover and refrigerate until set, about 2 hours - overnight. Do not roll them in sprinkles like in the photo, as the sprinkles do melt. *Truffles will be a little soft, so your hands will get a little messy, but it's worth it! Store truffles in the refrigerator if not serving right away. These look amazing! Such a fun treat to nibble on! Avocados truly are miracles. 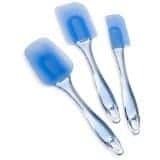 They can literally be used in anything and everything! 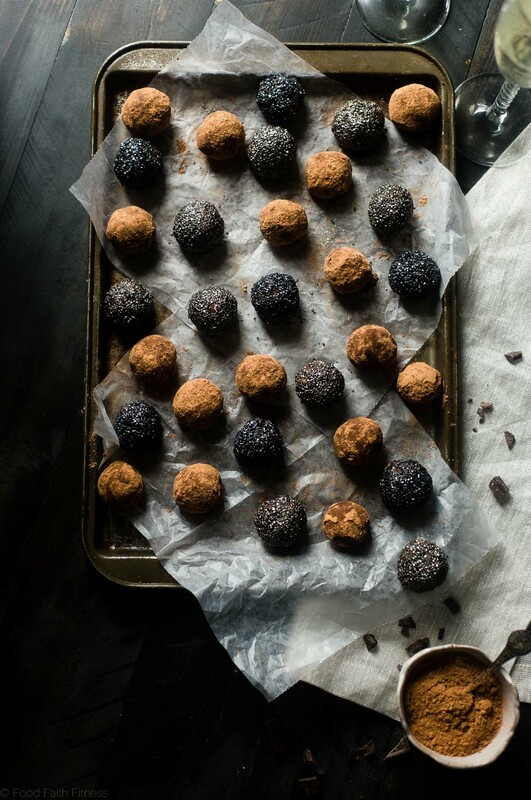 These truffles look and sound amazing – and so simple to make too! I’m not a huge champagne fan but how could I not try these out?? I am not usually a champagne fan either! But it gives these a super subtly yummy flavor! And yes, avocados really are the miracle workers of the food world! Gah!!!! If I accidentally devour all of these and go into a chocolate coma, at least I’ll go happily! These look deeeelish!! Quick question, think it would work with rum instead of champagne? Then I totally would roll them in chocolate sprinkles… cuz.. well, why not? HMMMMMMMMMMMM, My only concern is that rum has A LOT more alcohol than champagne, which might make them not set! you could try it, but maybe try adding less rum first?! Let me know if you try it! And, yes, DO IT. Chocolate sprinkles for all! 1) I’d totally eat these for breakfast! and 2) I think the glitter was totally worth it! These truffles look amazing! I knew I liked you 😉 Thank you! Yay to adding booze to recipes! Merry Christmas friend! You know I’m a sucker for champagne and chocolate! I think this may be the greatest truffle ever! I KNEW you would be all over these girl! Ooh I have an avocado: I should make these! It’s true that a good breakfast really helps those Monday mornings! You SHOULD make these! DO IT. oh this is seriously a fabu idea!!! everything chocolate I love, but fun that it’s perfect for NYE! Chocolate is LOVE! Thanks Amanda! Ahhh these look so delicious!! Perfect for the season! Wow! These look amazing! I want to munch on them all day! Sounds like a good idea to me! 😉 Thanks! Isn’t it awesome that cacao is now a “super-food”? These not only look gorgeous…We NEED to eat them for “health reasons”! looks delicious! always like to pair a tasty treat with some good bubbly. You and me both! Thanks David! It’s hard to resist a little bubbly with chocolate, but IN chocolate – now that’s mind blowing. Right? It’s definitely a great combo! Thanks Alisa! I love that overhead shot of the truffles on the pan – it’s beautiful! Truffles and champagne! I like how you roll! I think the end of the year is a wonderful time to celebrate life and, well, chocolate and bubbles will always be my preferred way to indulge. Hope you have a great holiday!!! Can I use white wine or something else different completely in place of the champagne? I really can’t tell you as I haven’t tested the recipe as such. Alcohol does cause things to not set properly so I would worry about trying something else! These look amazing! Thanks for linkin’ up with What’s Cookin’ Wedenesday! Careful now! If these were served at a party, I might get drunk from eating so much of these truffles! This looks awesome!! I have a whole bunch of avocados that I think need using here at my place. This looks like the perfect solution!